Hardwood flooring is constructed from either solid or engineered wood planks, providing a permanent way to bring the beauty and warmth of the outdoors into your home. In addition to hardwood's aesthetic appeal, the National Wood Flooring Association (NWFA) reports several environmental benefits. Indoor air quality is better than with carpet because the surface does not trap dirt. This smoothness also makes the floor easier to clean. 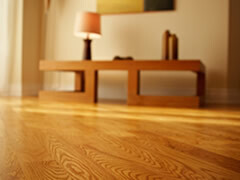 Hardwood uses less water and energy to produce than other flooring and is both renewable and recyclable. The many benefits of wood flooring help explain why 90 percent of realtors in a recent national survey said that houses featuring wood flooring sell faster and for more than houses without wood floors. Home Depot prices a classic 4" solid wood hickory floor by Bruce at $5.48 per square foot for the wood alone. A roughly equivalent type of engineered wood is $4.27 per square foot. As a general rule, solid wood costs more than engineered; and the wider the plank, the higher the price. Brazilian cherry is one of the most expensive woods and heart pine the least. Bruce is a popular brand for solid and engineered wood. Mohawk, Tarkett and Columbia also offer both types of plank. If you are interested in flooring not associated with rain forest destruction, ask about each wood's certifications. The most ethically sourced woods bear the Forest Stewardship Council (FSC) certification. You might also consider the latest eco-trend to create a one-of-a-kind floor with a history by ordering solid wood planks from a supplier specializing in reclaimed barn timber, panels, and siding. A well-maintained hardwood floor can last more than one lifetime, but the species of wood you choose will in large part determine the ultimate durability of your floor. Each wood has been rated for hardness using the Janka scale to provide a means with which to compare species. A soft wood, Douglas fir, has a Janka rating of 660. Brazilian cherry, known for its strength, has a rating of 2350. Many manufacturers offer a large palette of lighter woods like ash, hickory, beech or maple. Woods with a warmer effect like cherry and oak are also widely available. Walnut is a common option for a more dramatic dark wood. No matter what wood you choose, you will probably want to select one of these surface finishes. Wood floors have gaps, particularly solid wood floors, which meet at every plank. These gaps are energy leaks. You can remedy the energy ineffiency by insulating your hardwood flooring as its installed by adding wool insulation or by plugging holes and gaps with wood putty. Area rugs can also help considerably. You can visit showrooms and building supply shops to have a look at the wood species firsthand. Consider obtaining a sample to take home and view in the natural light. But if your interest is piqued and you want to get started now, fill out the form on this page to look for a contractor who can save you time and gas by bringing samples to your home and giving you quotes.